National Pretzel Day This Week! Buy any pretzel item and get an original or cinnamon sugar pretzel FREE! You’ll need to be signed up for the rewards program and have access to either their website or the Pretzel Perks app to access the deal. Entertainment Books $10.40 on Tax Day! If you ever wanted to try an Entertainment Book, now’s the time to do it! They usually run close to $30-$35 each at the beginning of the season. But for Tax Day, April 15th, you can get them for just $10.40 each PLUS FREE SHIPPING! That’s an incredible deal. It makes me wish I’d waited. I think I paid about $17 on Black Friday, and I don’t typically use it until summer rolls around anyway! I think for next year's book, I’ll wait! FREE Cone Day @ Ben & Jerry’s!!! Tuesday, April 9th is the annual FREE Cone Day @ participating Ben & Jerry’s ice cream locations. Stop by for a free ice cream cone or cup from noon to 8 PM and enjoy a scoop of your choice! Find your nearest participating location here. The closest one to me here in TX is almost an hour away, so I’ll have to miss out. If you have one close to you, consider yourself lucky! Love Boneless Buffalo Wings? Try This Deal!!! Every couple of weeks, I like to meet up with my adult son for lunch when he’s off work. Recently, we randomly decided to try out Buffalo Wild Wings. We were after loaded fries we’d had years ago in VA, but we discovered it’s no longer on the menu. However, they managed to whip some up for us anyway, and it was just as good as we remembered! Since we shared it, though, and it wasn’t an entree-sized portion but an appetizer, we decided to also order some boneless chicken wings. Much to our surprise, we discovered the wings were B1G1F that day, so we got two different kinds (medium Buffalo and honey BBQ) and even had some to take home to share with everyone else in the family. I was curious about this deal and stumbled upon the fact that this is something they offer every single Thursday! How cool is that? The deal on wings varies by location, according to their website, but B1G1F is the deal at ours on Hulen Street in Fort Worth. So if you’re a fan of boneless wings, give your local Buffalo Wild Wings a call and see what special offer they are cooking up for Thursdays! Are We Spoiling Our Children? As I get older and my children grow into adulthood one by one, I begin to ponder how well I’ve raised them. I loved them all the best way I knew how. They grew up through both lean times and times of plenty. Through it all, I tried to provide the best for them that I could offer within the confines of what we could afford. We made sacrifices so they could live a more comfortable life than we did growing up. Now that they are older, I’ve begun to wonder if that was the right approach. Are they spoiled? An older and wiser friend once asked me that. But never having been a parent himself, I didn’t give it much too much thought at the time. I do for my kids because I love them. I live a life of willing servitude for my family because I enjoy giving to them. Some are more appreciative than others. Some have more of a sense of entitlement than any real gratitude that I can see. Is it just a difference in personality, or did my choices create that attitude? 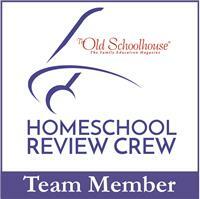 Homeschooling has been the forefront of my existence for the last 16 years. The years flew by in the busy-ness of it all. I’ve often wondered if I should have chosen another path. My frustrations with their lack of cooperation and responsibility in their school work frustrated me more as the years went by. I found myself yelling more often than I’d like, feeling a deep sadness and unhappiness welling up within myself for a number of years. 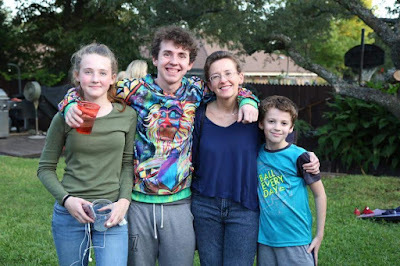 Suddenly, I didn’t feel like the mom I set out to be…the mom I was in the beginning. Was the sacrifice too great for the benefits? I don’t know. But I gave my best and perhaps more than was wise for my own well-being at times. Honestly, sometimes, I wonder if I was even cut out to be a mom, much less a teacher, too. Do you have these kinds of doubts? If I’ve gone about it all wrong, I guess it’s too late to fix it. I’m quickly turning them out into the world and wondering what will become of them. I know I started out with all the best of hopes and intentions, trying to mold their hearts into loving, God-fearing little souls who would leave a meaningful mark on the world, making it a better place than the one they entered. I guess it’s too early to tell if I did my job well or not. I tremble at the possibility that I’ve failed, because that amounts to a failure of epic proportions…essentially my whole life’s work. That’s a sobering thought. In the meantime, I continue to make them three meals a day whether they choose to eat them or not, do all the shopping, do their laundry and put it all away, clean up their messes, make their beds, and clean their rooms. I surprise them with little treats and treasures to let them know I am thinking of them even when they aren’t with me, and I do all kinds of small gestures and kindnesses to let them know they are special people in my life, and I’ve given them my time, attention, and a heart full of love. I guess the scary part of parenting is that in the end, you just don’t know how they will turn out. There’s no instruction manual, and situations arise sometimes to which there is no obvious answer, so you just do the best you can. There were times I butted heads with my parents, but mostly, I just loved them, respected them, and appreciated their approval tremendously. I no longer have either of my parents, and I’m sad for that. I wish I could have shared more of my life with them that time allowed us. All I can really do is pray and study the bible and hope I’ve done right by my kids. But honestly, I just don’t know! I guess time will tell. Sorry I don’t have any words of wisdom to offer. I obviously don’t have the answers to this parenting gig. But then again, do any of us? I was super thrilled to be reviewing Drive Thru History® “Acts to Revelation” by Drive Thru History® since I enjoyed reviewing Drive Thru History® “The Gospels” a couple of years ago. 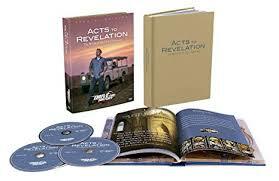 Drive Thru History® “Acts to Revelation” is essentially the sequel to Drive Thru History® “The Gospels” that came out in 2017. It continues Dave Stotts’ journey through the remainder of the New Testament, beginning with the book of Acts. This DVD set includes 3 discs and 18 episodes with each episode lasting 30 minutes. It comes in a hard-sided case with a thin cardboard outer sleeve and a full-color book/study guide built into the case. It’s intended for viewers in grade 6 through adults, but even younger children can enjoy the series. It can be purchased for just $89.95. You can watch a trailer and see if it’s right for you. Let me start by saying that I enjoyed the previous series about the Gospels so much that I was super excited to continue this journey through the rest of the New Testament. 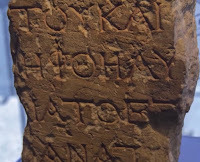 I am a Christian, and while I have a strong belief system, I also have a deep appreciation for history and archaeology. So any time I can tie the two together and use one to reinforce my beliefs in the other, I’m very interested in doing so. For me, that’s what makes this Drive Thru History® series so remarkable and fascinating! I was the primary viewer for this, although my husband and my 11 year old son did join me for a couple of them. My husband remarked that it seemed like a really interesting program. 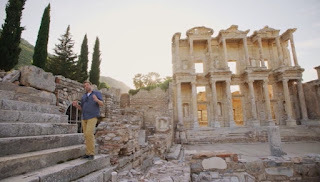 My son thought it was super cool that Dave Stotts got to walk through the ruins of places where the disciples once walked, and he said he wished we could take a trip there some day and see it for ourselves. Personally, I was mesmerized by the twelve episodes I got to watch during the review period! Sometimes, I really had hard time turning it off to go to bed. Each episode left me anxious to see the next one. With only 6 more episodes to go, I know I’ll ending up watching this series again and again and will be inviting others from church to view it with me. The timing of this was perfect for me, because we’re currently studying the book of Acts at our Wednesday night adult bible study class. Before I viewed each episode, I reviewed the information in the book/study guide. 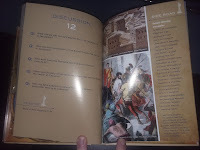 It provided me a nice overview of what each episode would be about, some basic discussion questions you’d use if you were using this as a study with your children, a “Side Road” section with a bit more historical and cultural background information on the people and places in the episode, and a nice array of related full-color photographs and illustrations with labeling information. Complete answers to the discussion questions are located in the back of the book. I would describe the discussion questions as more like comprehension questions. They have factual, defined answers rather than requiring any deep thinking or drawing of conclusions. They are something I’d use to make sure my kids were paying attention and understood the basics of the episodes. 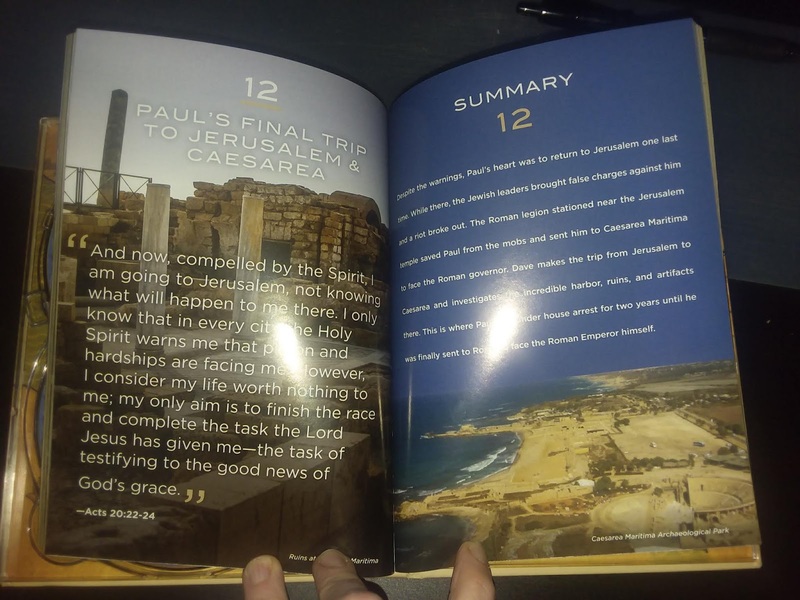 The episodes I watched took me through Pentecost, the growth of the early church, the spread of the gospel to the gentiles, Saul’s encounter on the road to Damascus, Paul’s three missionary journeys and the opposition he faced along the way, and his final trip to Jerusalem and Caesarea where he appealed to have Caesar hear his case. The remaining episodes will cover Paul’s shipwreck at sea and his experiences on the island of Malta, his final journey to Rome, the martyrdom of Paul and Peter, John’s experiences on the island of Patmos, the events of Revelations, and the end of the New Testament period. 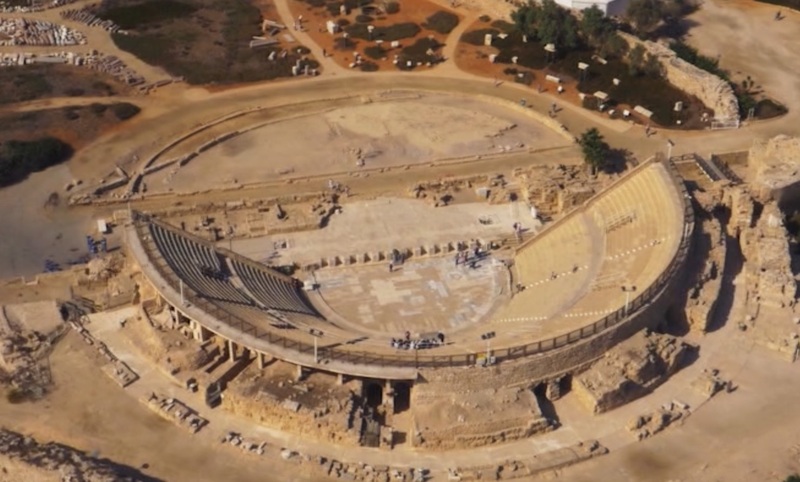 Throughout the episodes, I saw the ruins of outdoor Roman ampitheaters, roadways, public baths and toilets, temples to pagan gods, jails, a library, and the remains of places where Paul taught those who would listen. 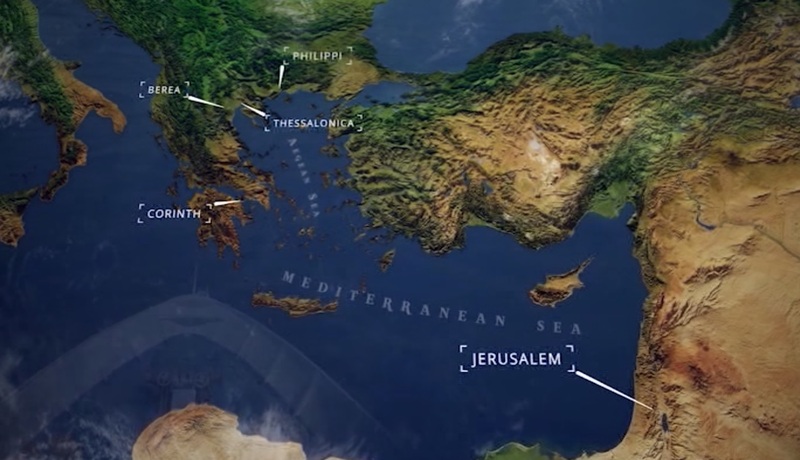 Seeing these places as Dave Stotts shared the stories of Acts, Corinthians, and Ephesians really helped me to visualize the environment where these events took place. It helped me to understand how physically taxing it was to travel during that time. It helped me to understand Roman culture. It helped me to “see” in my mind’s eye what it must have been like for the apostles to speak to the masses that gathered around them. I better understood why the Jewish leaders felt so threatened when Jesus spoke outside the temple…it was because the Jews from the diaspora returned from foreign lands to keep the feasts and gathered en masse at the temple. Jesus had been able to speak to them there, right on the doorstep of the Jewish leaders, and the leaders witnessed the attention Jesus received and the thousands who were baptized right then. 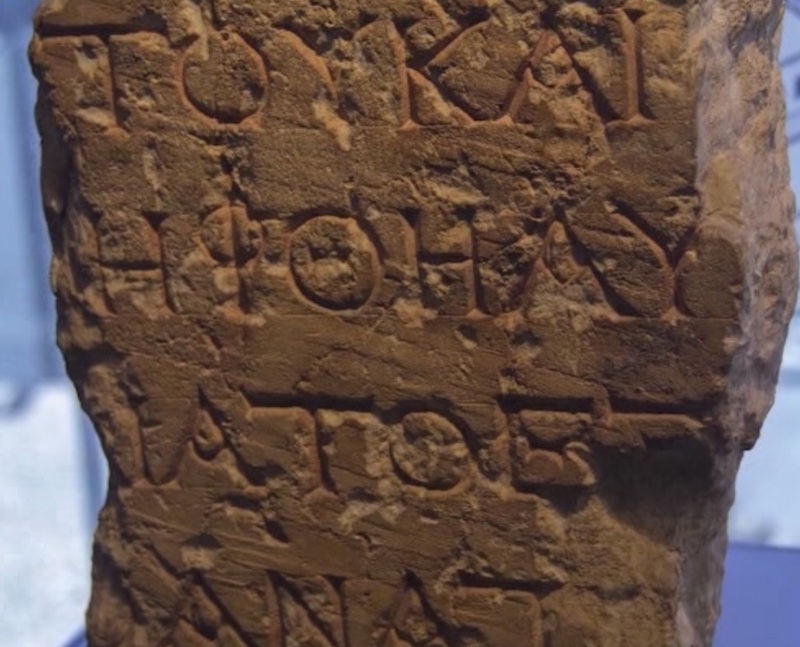 I also saw many of the inscriptions that have been uncovered that match up perfectly with names and dates of various Roman leaders mentioned in the scriptures, supporting the great historical accuracy found in the bible. In short, this series is all that I’d hoped it would be and more, and I feel even more immersed in the Bible after watching it. It has definitely strengthened and deepened my understanding and has given me an even richer historical experience. I highly recommend this series to anyone looking for a deeper experience and also to be shared with those who are on the fence about the scriptures because they have a need to see it tied to factual historical findings. It would be great for individual study but also to be viewed as a family. I had some great conversations with my son while we watched it together, and I could see his eyes get bigger every time an archaeological finding matched up with something he already knew from the scriptures. He was just as fascinated as I was! Take a look at what other Crew members have to say about this wonderful series by clicking the banner below. As an early celebration of St. Patty's Day, stop by any Michael's store between 1-3 PM with your kids so they can make their very own super-glittery green slime! They're calling this the Pinch of Luck Slime Event. Through St, Patrick's Day, Papa John's is offering FREE delivery on orders of $10 or more placed through the Door Dash website or app at participating locations. In celebration of this first day of Spring, Rita's Italian Ice is offering a free Italian ice treat to customers who stop by between noon and 9 PM. Dairy Queen is offering a FREE small vanilla cone to any customers who stop by a non-mall location during business hours. Enjoy your treats this week!